Richard F. Welch. 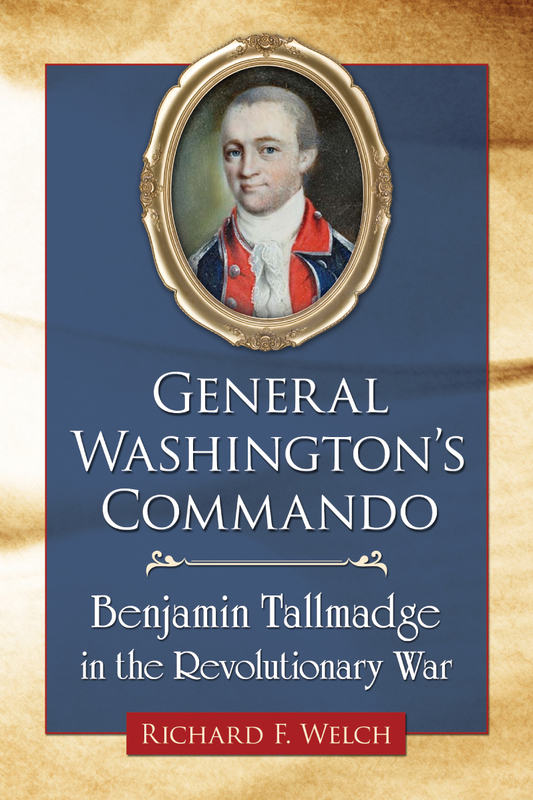 General Washington’s Commando: Benjamin Tallmadge in the Revolutionary War. North Carolina: McFarland, 2014. Pp. 204. Photos, notes, bibliography, index. ISBN 978-0-7864-7963-4. Softcover, $35.00. Richard Welch offers a comprehensive biography of Setauket native Benjamin Tallmadge, an important, though little appreciated, figure in the history of Revolutionary War spy-craft and intelligence gathering. His book takes advantage of a rich array of primary sources, many available on Long Island, including personal reminiscences, military records and both official and unofficial correspondence, to craft a well-written account of the life of Tallmadge. The book is extremely well researched and written in a style which will appeal to both scholars and a general audience interested in this fascinating aspect of American military history. Welch highlights some interesting information about the Revolutionary War, including the fact that prior to the Battle of Long Island the “British invasion force, comprised of over 25,000 troops that landed on Staten Island, was the largest invasion force ever assembled until the battle of Normandy in 1944” (10). He weaves together threads not usually connected, such as the relationship between Nathan Hale and Tallmadge, describing how their Yale connection may have inspired Tallmadge’s interest in gathering intelligence; his involvement in the arrest and execution of Major John Andre; the death of Tallmadge’s brother William on a British prison ship; and Tallmadge’s close working relationship with General Washington who increasingly relied upon his junior office as his spy master. Welch asserts that their relationship began during the early battles of the war, and eventually led to mutual affection on a personal and professional level, and “deep devotion” on the part of Tallmadge (34). Welch’s thoughtful assessment of General Washington’s mindset about the difficulty of defending New York during the early years of the Revolution, and the loss of Long Island, leaving the British with comfortable winter quarters and an effective base of operations illuminates one of the general’s most difficult challenges of the war (12-13). Overall, the author offers carefully researched descriptions of the battlefield activities Tallmadge engaged in, and articulates the belief that in many ways the American Revolution functioned as a civil war, with various segments of the population, both Loyalist and Patriot, acting to settle scores or punish those they with whom they disagreed or considered treasonous. Although Tallmadge never directly acknowledged his role as the leader of the Continental Army’s espionage network in New York City and Long Island, historians have documented his involvement and leadership role. The Setauket (or Culper) Spy Ring was instituted and run by Tallmadge, who set up the network and recruited members. Welch credits Caleb Brewster, another Setauket native and friend of Tallmadge, with possibly suggesting using Long Island as the central hub and conduit for acquiring the military intelligence needed so desperately by Washington. An eager participant in the so-called “whaleboat war,” Brewster served regularly on detached duty from his Continental Army regiment, crossing Long Island Sound to raid the British occupying his childhood home (35). Ostensibly designed to harass the British, raids soon degenerated into piracy, with Long Island residents suffering robbery and assault at the hand of raiders from Connecticut. Welch carefully outlines the planning, execution and outcomes of a number of these raids. In addition, he paints a vivid picture of life on Long Island during the British occupation, where the “maurauders” did not distinguish between “Whig and Tory” in their plundering and illicit trade. (51-52). The illustrations and images used in the book bring life to the written word, and offer additional perspectives on the text. The self-portrait of John Andre, for example, evokes Tallmadge’s ambivalence about the execution of this British officer; Talmadge rued the escape of Benedict Arnold, labeling him the Traitor, while depicting Andre as the Sufferer (83). The interesting map of Tallmadge’s area of operation—including Long Island, Connecticut and what is now Westchester County—allows the reader to envision the broad range of operations Tallmadge oversaw for Washington (112). Welch highlights the famous raid on Fort Saint George in November of 1781, providing new details about the formulation and execution of the plan to destroy a large quantity of hay and forage stored by the British in Coram, and to attack and capture the fort in Mastic, which involved dangerous reconnaissance by Tallmadge and his spies. The attack was a spectacular success, garnering praise from General Washington (91-92). After the victory at Yorktown, with Long Island and New York still occupied, Tallmadge planned and executed another raid, this time on Fort Slongo near Huntington, NY, again using intelligence gathered from his agents. The successful raid, achieved with total surprise, yielded at least twenty-one prisoners, some seventy muskets, as well as a cannon and ammunition. By carefully documenting Tallmadge’s strategies, the author expands readers’ understanding of the importance of the spy network he developed. According to the author, Tallmadge’s account of General Washington’s leave-taking of his officers at Fraunces Tavern in December 1783 is the only contemporary record of that emotional meeting. After the war, Tallmadge returned to civilian life in Litchfield, Connecticut where he served as a Federalist Congressman. Deeply concerned about the welfare of rank-and-file veterans, he supported efforts to provide pensions for this group, and advocated half-pay pensions for surviving officers. Interestingly, however, he refused to sanction increased support for the three militiamen who had captured Major John Andre. (157-158). By delving into the history of this soldier and intelligence officer, Welch has illuminated the importance of both Tallmadge and his spies in the overall prosecution of the war. Readers will come away with a greater understanding of the occupation of Long Island as well as the challenges and opportunities Tallmadge faced in developing spy networks in the face of overwhelming British military superiority.